The sterling corporate bond market is a fairly opaque over-the-counter market. Despite its large size and its importance for the real economy as a source of funding, corporate bond markets globally are seen by some as “shockingly archaic”, with perennial worries about liquidity. Facing this mismatch between the market’s importance on the one hand, and the lack of transparency and efficiency on the other, it is vital to know more about how different investor types behave and interact. Little is known about actual investor behaviour in fixed-income markets. Only recently, Timmer (2016) and Abassi et al. (2016) shed some light on differences in the behaviour of investors with regulatory holdings data from German financial institutions. In a recent paper, we complement these studies using ‘Zen’, the FCA’s proprietary transaction database. The Zen data capture all corporate bond transactions for firms regulated in the UK, or branches of UK firms regulated in the EEA. The database is special compared to other corporate bond transactions datasets (e.g. TRACE in the US) since it usually includes the identity of both counterparties involved in the trade. The dataset covers the period from September 2011 to December 2016, giving us around three and a quarter million observations. So what do we do with this rich dataset? We start by shedding light on the sterling corporate bond market. We find an average daily trading volume of £1.4bn and an average trade size of £550,000. An average bond was issued five years ago and has a residual maturity of around nine years. 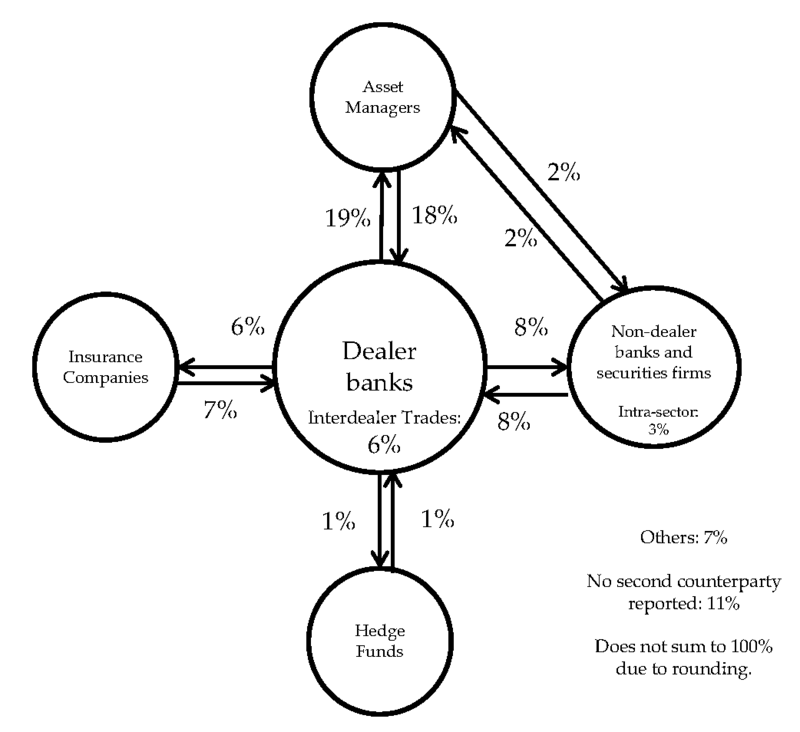 The vast majority of trades (84%) involve a dealer bank (Figure 1). Trades between dealer banks and asset managers account for more than one third of the trading volume in our sample, followed by transactions between dealers and insurance companies, which account for around 13% of trading volume. *As a percentage of total trading volume. Arrows point from seller to buyer. We do not report the transaction market shares where the flows are less than 1% of total trading volume (which, in aggregate, account for 7% of the total trading volume). We also do not report the market share of transactions in which the second counterparty is missing (11%), almost all of which have dealer banks as the first counterparty. How do different investor types react to a rise in yields? We want to understand what investors do following a rise in yields (i.e. a drop in prices). To do this, we separately look at the buying and selling behaviour of the key players in the corporate bond market. More precisely, we regress the natural logarithm of the net amount bought or sold on lagged first differences in yield changes (in order to mitigate autocorrelation and endogeneity issues) and several control variables. We do this separately for each investor type in order to determine whether an entire sector is a net buyer or net seller of a bond following a change in yields. The results are highly statistically and economically significant. We find that when corporate bond yields rise (i.e. prices fall) in a given week, then the following week — at a sector level — insurance companies, hedge funds and asset managers increase purchases and reduce sales: they are net buyers. This ‘countercyclical’ behaviour – buying as prices fall – could reflect a simple rebalancing of portfolios: when yields rise, the value of bonds in investors’ portfolios falls, so investors buy more bonds to rebalance their portfolio back to the desired weight. Alternatively, an increase in yields could make bonds look more attractive to investors, so they increase purchases. Such behaviour could be related to so-called ‘reaching for yield’, which we discuss in more detail in our paper. We find that dealer banks clear the market by being net sellers (accommodating the flows of the other investors). To give you a sense of scale, a 10 basis point increase in corporate bond yields leads corporate bond purchases the following week to increase by 18% for insurance companies, 10% for asset managers, 11% for hedge funds, and to decrease by 11% for dealer banks. But these results reflect the average behaviour between September 2011 and December 2016 – what happens in times of stress? 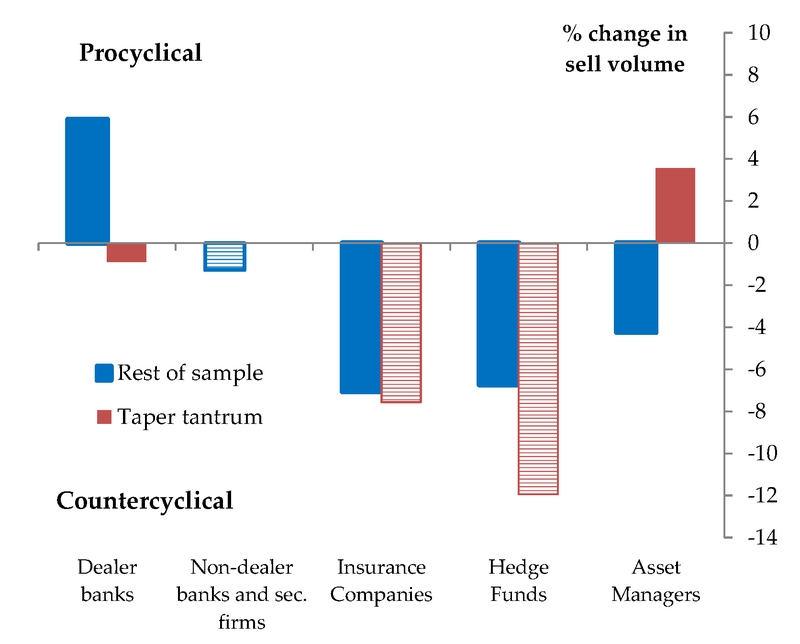 We find that asset managers were net sellers in response to a rise in yields during the taper tantrum (Figure 3). During this period, dealer banks bought more and sold less, clearing the market. *Hashed bars indicate no statistically significant coefficient. 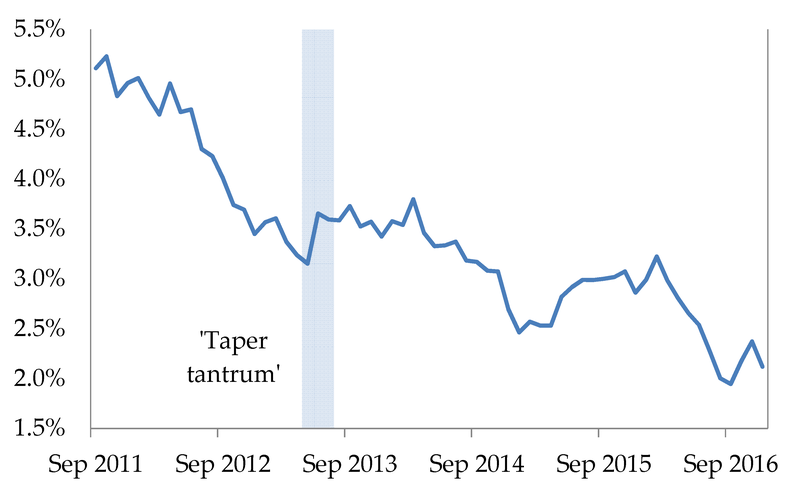 The ‘taper tantrum’ period is May to July 2013. 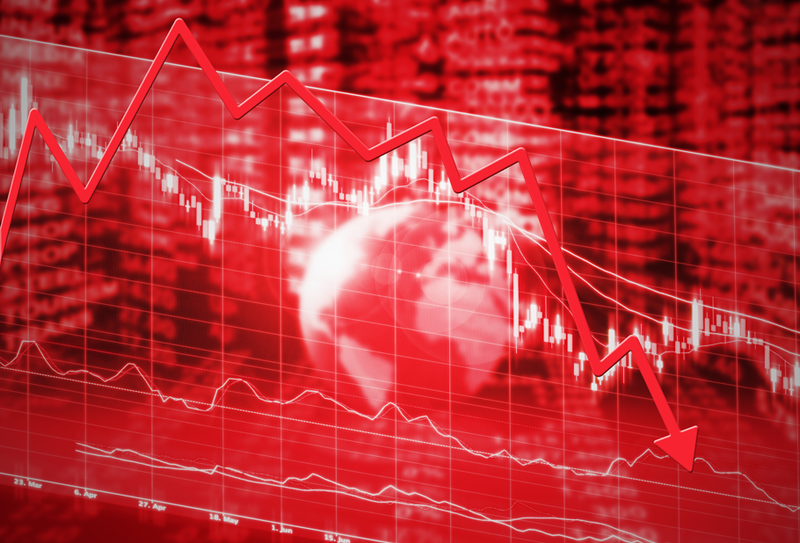 Such ‘procyclical’ behaviour – selling as prices fall – in times of stress could amplify asset price moves and increase volatility. For asset managers, particularly in the case of open-ended investment funds, the procyclical behaviour during the ‘taper tantrum’ could have reflected a need to sell assets to meet redemptions. Our results have important financial stability implications. The procyclical behaviour of asset managers during the taper tantrum, if repeated in future times of stress, could amplify asset price moves, potentially causing prices to fall below what would be implied by fundamentals. Sharp and sustained falls in corporate bond prices may reduce the ability of some companies to service or refinance their debt, threatening their solvency. Moreover, if some companies are unsure about the price they can issue bonds for, they may be deterred from raising new finance. This could result in companies cancelling or delaying investment. A significant disruption to the corporate bond market could harm the supply of credit to the real economy, and impair the transfer of risk to those who are best placed to manage it. Robert Czech and Matt Roberts-Sklar work in the Bank’s Capital Markets Division. Previous Post Does domestic uncertainty really matter for the economy? How might the hypothesized pro-cyclical response to redemptions of asset managers compare to the behavior of investors in–and managers of– exchange traded corporate paper products (like Blackrock’s $39 billion iShares iBoxx $ Investment Grade Corporate Bond ETF $LQD)? Generally autocorrelation will exist in market periods of stress, even after first order differencing. Was this tested during the taper tantrum period specifically?